Has Any One Had 0r Tried These A460 Intakes . 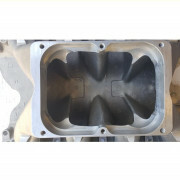 Eliminator Big V Intake . Witch 1 Is Better . GFPRACING wrote: Has Any One Had 0r Tried These A460 Intakes . KFM Custom Trick Flow A460 single Dominator Intake . The KFM intake looks like the Mahoney intake built by BES. If Keith's intake performs like the BES intake it'll be a bad bad piece. 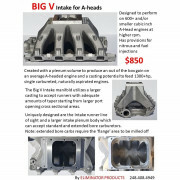 I dont know about the KFM intake, but the Eliminator Big V is about $850!! 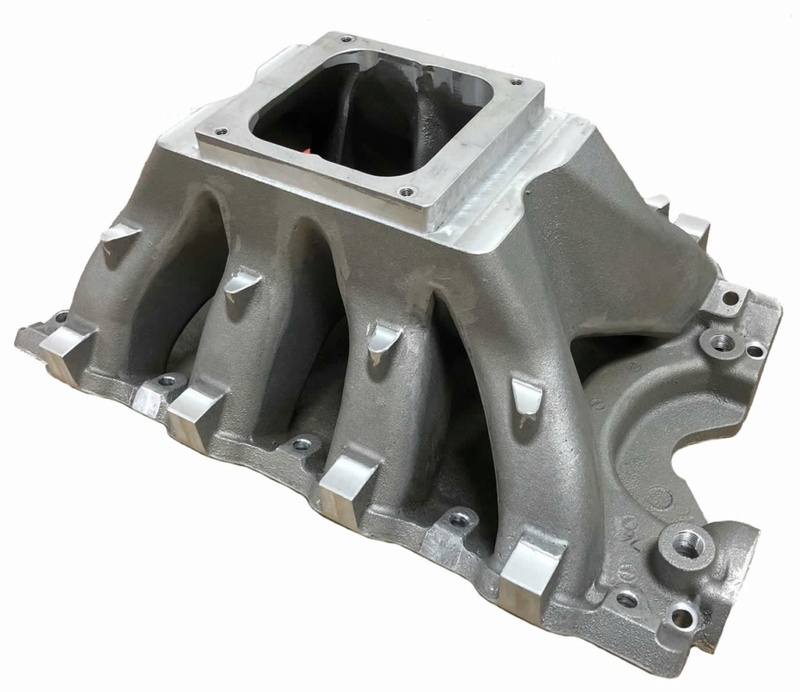 And $850 is substantially cheaper than the modified TFS intake with hours and hours of milling and welding, i would think. Keith did say on the TFS tunnel ram he had 3 days worth of porting. The Highly modified Trick Flow single 4 ran fine. it was a custom order several years ago. The Big V Eliminator makes it unnecessary to ever build another one. The $850 Price of the Big V is a wonderful value. If I charged $3000 to build one like my old Frankenstein, I would lose money on the deal. An experienced porter can use the Big V as a starting point to do whatever is required to meet high RPM needs. What Can You Do ? . 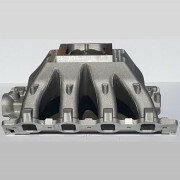 to In Prove The Eliminator Big V Intake ? ? ? . . . I have a Pro Stock Maverick . Steel Roof & Quarters ! . Carbon Fiber . Complete Front End , Doors , & Deck !. 25.1 ? All Chrome Molly Chassis Car . 2100 to 2200 lbs . Complete Car , 170 lb Driver . & . BBF Drive Train ! I am Building a 557 . On the Eliminator Big V Intake ! . Why is the Top . 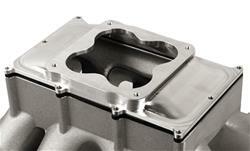 Machined around the Carb Mounting Area ? . Is The Carb Mount ! . Added On After the Intake is Made ? . If So Can You Get it With Out The Carb Mount ? . 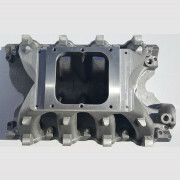 Can You Get it With Out The Machining Done ? . So You Can Do What You Want With It ? . I Just Don't like the Looks of That Area ! . That Said I will Proabably . Sell My Trick Flow Tunnel Ram . It Looks Like the Carburetor Mount Plate . Should be Another 2 , 21/2 inches Higher ! . Roof of the Front 2 & Rear 2 Runners . Tapered on Up to meet it ! . Would Do to Your Interceptor Heads ? . Intake Port Flows about 533 CFM at .900 . Exhaust Port Flows 400 CFM at .900”. Port Configuration Resembles a Thor Gen II in Entry Area . Port is “Twisted” Slightly to Match the Angle of the Intake Valve . 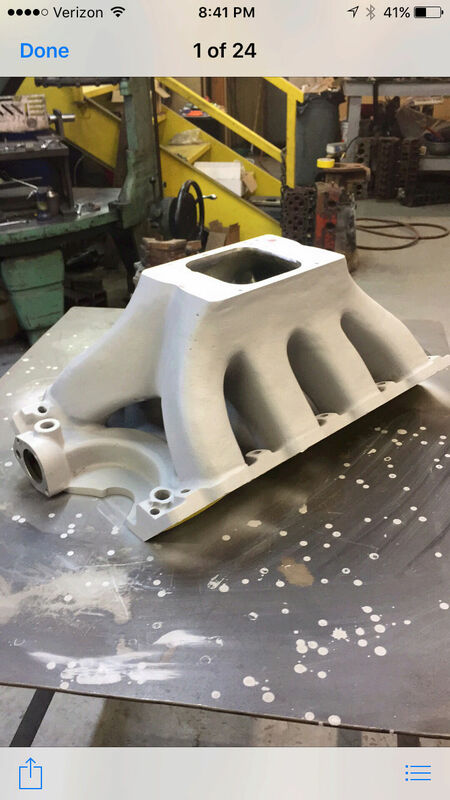 Very Large 412 CC Intake Port . For a Big Bore Engine . 2.5” Intake Ferrea Titanium Valve . 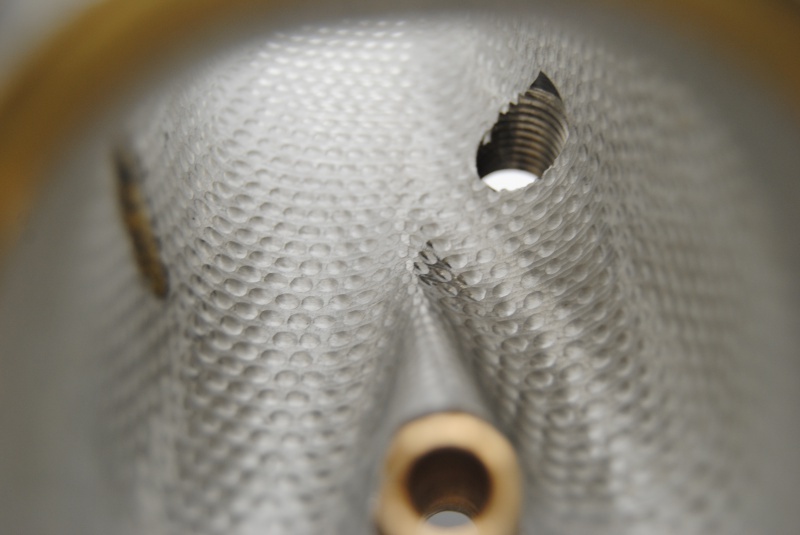 Use a Proprietary Valve Seat Mojo . That Belongs to Engine Systems . Valve Job is Typical of the Thor Headed Engines . 69 CC Combustion Chambers . After .015 Clean Up Cut . It you Did your Re Work ! . 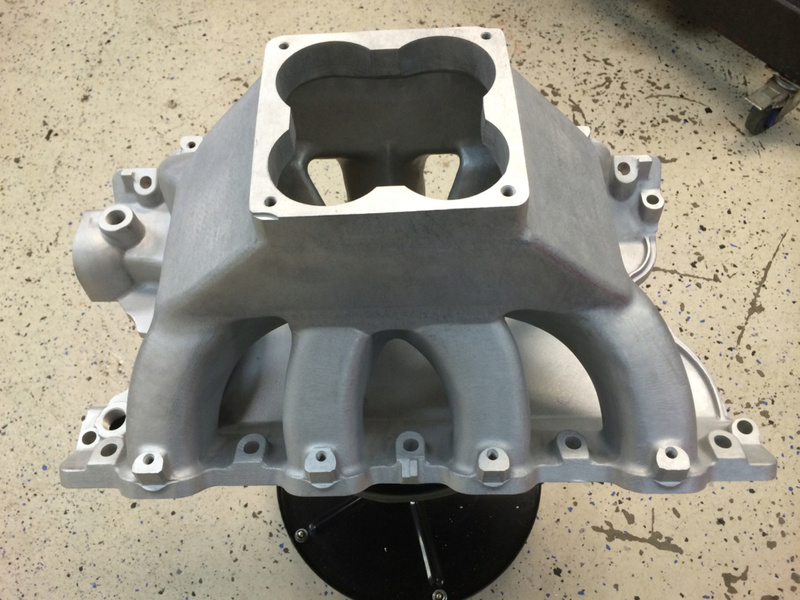 The Eliminator Big V Intake ! . 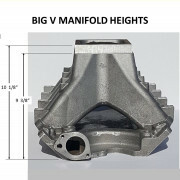 The Big V is a single 4 barrel manifold that comes machine to mount a standard Dominator flange carb. The strange machining at the top gives the builder the choice to machine the Dominator pad off and machine it to mount one of the "spread bore" carbs. The single 4 Big V will NOT out perform a tunnel ram and 2 carbs. If you want maximum power output, use the tunnel ram and 2 dominators. If you run a class that prohibits tunnel rams....The Big V is a good choice. I have no opinion on port dimpling and would not do that to my Interceptor heads. Too bad the Big V is an A head intake. It would be nice to see the Air Boss intake tested on your engine though. The Big V or the KFM intake will not bolt onto SR-71 heads. BBFTorino wrote: The Big V or the KFM intake will not bolt onto SR-71 heads. I think that's why he said "Too bad the Big V is an A head intake"
If you Mill the Top Off . You Can Drill the Bolt Holes were you Want them ! .